My good friend and chef extraordinaire Tracey Black developed this tender and juicy recipe for Spring Navarin of Lamb. Tracey will be re-opening her fine food store and Ottawa-based catering and gourmet take-away store in early April. Details below along with my wine pairings for this dish. Cut lamb into 1 inch cubes and pat dry. Season lamb with salt and pepper. Heat saute pan to medium-high temperature; add vegetable oil and brown lamb in small batches. Set lamb aside in braising pot. Saute onions in browning pan, adding garlic when onions have softened. Add rosemary and thyme when onions have browned. Saute for 2 to 3 minutes and then add mixture to lamb. De-glaze browning pans with red wine and reduce by half. Add tomato pulp and wine to braising pot. Add enough stock to bring liquid level to just below covering meat. Bring to a boil, reduce heat and simmer for 1½ to 2 hours or until fork tender. Lamb can also be placed in 350 F oven for the same amount of time. While lamb is braising, prepare vegetables. Separately, cook carrots, potatoes, onions and green beans in salted water until just done – keeping them slightly crispy. Cool them immediately in ice water. Saute mushrooms and leeks. 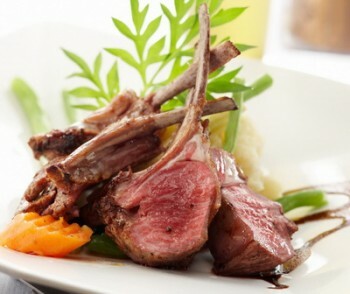 Here are two wines I’d match with this dish, though you’ll find many more wine pairings for lamb here. Lemon lanolin with a refreshing zestiness yet rich texture. Lovely white for so many dishes. Food matches: sautéed mussels, barbecued freshwater fish, pizza with spinach and feta cheese and lamb with herbs or mint sauce. This is a blockbuster wine that will benefit from a few years in the cellar. Big, fleshy black fruit, toasty oak and ripe tannins. Decant for 2 hours. Perfect with lamb, prime rib or filet mignon. This recipe was created by Tracey Black, chef and co-owner of Epicuria, a retail fine food store and full service caterer located at 357 St. Laurent Boulevard (just north of Montreal Road ), Ottawa, Ontario. Telephone: 613-745-7356. Visit Tracey Black’s wine and food blog Epicuria.